We make lots of pizza in our house, sometimes I am told it is too regular on the family dinner menu. Boo to that, I say! I love making pizza, it is so easy, the hardest part is remembering to make the dough far enough in advance to allow it to rise. Everyone can have a blob of dough and make their own pizza shape and variation and get all floury in the process! In the interest of listening to the mob and trying to make pizza more interesting I decided to make a couple of variations to see how they worked. The first one is an idea from Pizza Express in the UK and when I had this pizza a couple of years ago when we were home, I was flabbergasted – what a simple but fab idea – why I (or anyone else for that matter)had not thought of this before, I don’t know. The pizza has a hole in the middle which is piled with salad. Well, how hard can this be I thought, I snapped a photo to remember, not to Instagram – honest, that is a part of Insta I have managed to steer clear of, like nail art……..anyway back to pizza with a hole. What I can’t believe is that I have had this idea swimming about for a couple of years and only made one last week and no, I didn’t need to reference the original photo. How on earth did you do that? I hear you cry! Here’s how. I made the dough using half this recipe, then once it is in a pizza shape, I used a big round cookie cutter to cut out a hole in the middle. It doesn’t turn out a perfect round in the middle, more a rustic circle. Make the hole once the pizza is on it’s cooking pan, a Lifesaver/Polo shaped pizza is difficult to move successfully as I found out! Be sure to flour the cooking pan well so that the pizza doesn’t stick when it is cooking. Add toppings as you normally would and cook for slightly less time. Once your lovely pizza is done, fill the middle space with your favourite salad and be proud of your healthy pizza with built in salad! This second pizza was our attempt at a stuffed crust, we made a regular (ish) pizza shape and rolled the edges over string cheese to make a cheesy filling all around. The recipient of this pizza is not into regular tomato sauce so I just popped on some olive oil, olives and rosemary, topped off with parmesan. Not as healthy as the salad pizza, but a fun pizza for a change. Do you make pizza? These two would of course work with store bought dough, so go on, have a go and let me know what shapes and variations you come up with! Love the idea of the pizza in the middle, and it looks fantastic! My daughter loves pizza, but I can’t convince my son…. yet! I am sure your son will grow to love pizza too! The hole in the middle seems so obvious now, but I never thought of it before. I miss Pizza Express!!! I had a visit home to York last year and took my husband… how good are the dough balls and that salad dressing! I love dough balls and garlic butter there! I sometimes make my own dough balls and the kids love them. We once asked a pizza place here if they did dough balls and they brought out some raw dough……not quite what I meant! oh my. These both look super delicious. I can’t believe I’ve never seen this holey terrific pizza idea! So wonderful. I usually just dump my salad on top, in the middle, making the point of the slice a bit soggy. This is a revelation! I know! How have we not figured this hole in the middle deal out before! Thanks! They will both be made again very soon I am sure. That second pizza is exactly how I love mine. 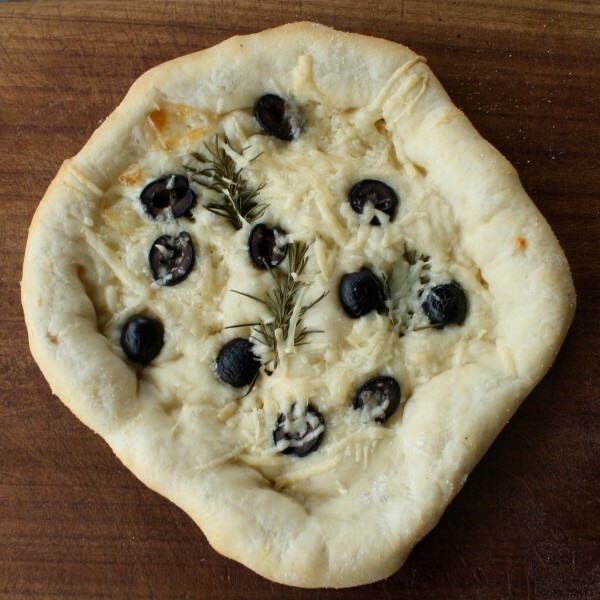 Nice and simple – no sauce, just some olive oil, herbs, olives and parmesan. Pizza is a regular in our household too. Must try the holey one. Looks fab. My teen likes the plain pizza best. I like the holey one best!